Yesterday 3D Systems unveiled Cubify.com, something that we have been working on for some time now. In my earlier post “What Is Cubify?” I really couldn’t say much. Not any more. Cubify.com is not an ordinary content and e-commerce web site. We have designed it as a platform that will take 3D printing to the masses. When I say platform I mean something much more than a bunch of web pages and scripts talking to a database and storing STL files in a file system. We have built Cubify with an API from the start (see cubify.com/api). 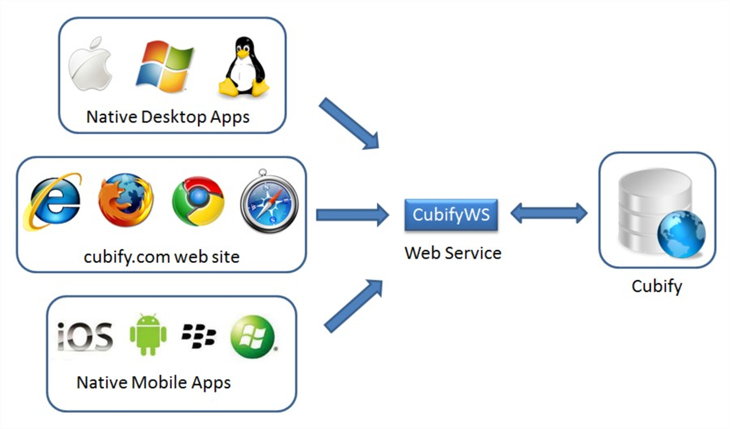 The Cubify API allows third parties to develop apps that extend the Cubify platform. In fact, the cubify.com web site in itself is one huge Cubify app which talks to Cubify using the API. So basically you could create an exact clone of the cubify.com web site, make it call the appropriate Cubify API’s and it would work exactly like cubify.com. Not that I recommend doing that, but I think you get my point. Ever since I started writing software I have always been fascinated by platforms. I’ve been building plug-ins to CAD platforms for more than a decade now trying to extend them in my own small way. As a software developer I know all too well that one person or company cannot build everything. It makes much more sense to build a platform so that others can contribute. If they can make money while doing so, even better. Mark Zuckerberg started Facebook to compare mugshots of girls and then ended up scaling it up to do other things until it became what it is now – a social platform . I don’t think he ever dreamed that a someone would write a app like Farmville which would end up having 33.5 million active monthly users on Facebook. Now, I’m not suggesting that someone will write a 3D printing Farmville app for Cubify. In fact, I have no idea what kind of apps people will create on Cubify. And that’s the beauty of it. All we want to do is create the best possible platform for 3D printing and watch and help others take it to levels only limited by their creativity and imagination. For those of you still trying to get a grip of what I’m talking about, imagine an app that personalizes a toy by letting a kid put his name on it. Obviously its no use giving the kid the 3D file of the toy and then some CAD software to work on it. He’s a kid after all. CAD software is not fun. But what a kid can do is pick a model of the toy he wants from the Cubify store and pick a web app that will customize that toy. Then run the app on the model in the cloud, enter his name and he gets his very own personalized 3D model of the toy. Now if he has a Cube or any other 3D printer, then he can print the toy himself. Otherwise he can ask Cubify to print it for him and ship it to his door step. And by the way, all this could be done on a phone or tablet as well. I’m a huge fan of cloud computing for this exact reason. One of the reasons we built Cubify as a platform was so that we could create native Cubify client applications for desktop and mobile devices. We are developing these clients and hope to release a beta soon. When that happens, developers will have another way to develop and sell their apps. They could develop apps as plug-ins to these Cubify clients which would also be sold on the Cubify store. These device apps could use the device hardware to do much of the heavy lifting that may not be possible with the web apps. In fact, developers need not wait for the Cubify clients to show up. They could develop apps which plug into existing software. A good example would be an app which is a plug-in to the the free and easy to use Google SketchUp which does the same same thing I mentioned above, but on a desktop instead of the cloud. Personalization and customization of existing 3D data is just one thing. There is also this whole concept of 3D geometry creation. I mean someone could write an app to create a toy from scratch. An example would be a train set. The app could have a series of graphic windows where the kid enters the details of the engine, carriages, tracks and the geometry is cooked up on the fly by the app. So in effect the toy is actually an app! Think about it. Why go to a shop and buy a toy for a kid when you can gift him an app to create his own toy, have it 3D printed and sent to him. I have used the example of a toy. But this could be applied to every age group. Back in April 2011 when I sold both my companies to 3D Systems some of my friends asked me why I did it. I mean, I’m a CAD guy and 3D printing is something that comes after CAD. What I could not mention to them at that time was a conversation I had with Abe Reichental, the CEO of 3D Systems, during one of our acquisition meetings. He said to me, “We need to build something that will let an 8 year old to an 80 year old do 3D printing“. He then proceeded to lay out his vision for 3D printing for the consumer market. It was then I first heard the name Cubify. Then and there I knew that I had to be part of this revolution. Because that is precisely what it is. A 3D printing revolution. And Cubify is in the center of it.